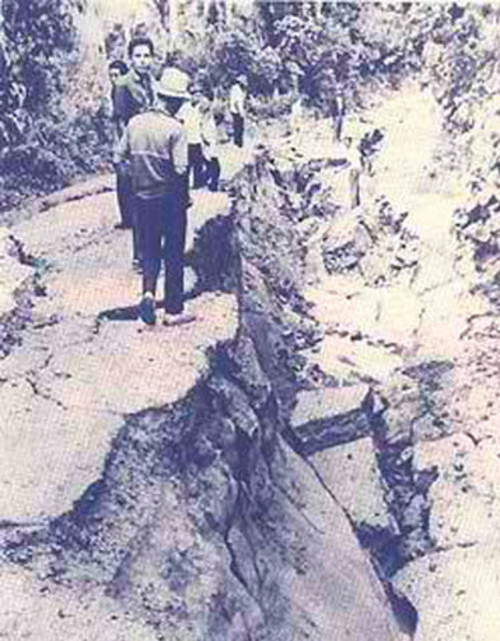 On August 2, 1968 at about 4am, a magnitude 7.3 earthquake hit Casiguran in Aurora province. Manila which is located relatively far from the epicenter, suffered the worst impact of the tremor. The earthquake is one of the most destructive to hit the metropolis, which caused the collapse of buildings, killing hundreds of people. Ruby Tower, a 6-storey building in Binondo, Manila, was among the buildings that were severely damaged. In it were 38 commercial units and 76 residential units. "The upper floors fell southwards while the southern end of the roof moved about 30 feet south and 10 feet east. The lower floors appeared to fall close to their plan position." Striking at a time when most people were sleeping, massive loss of lives was inevitable. Among the 270 people who died, 268 of them were buried alive in this building. Of the 261 injured, 260 were from the Ruby Tower as well, some of whom died later on. The search and rescue operations involved around 6,000 volunteers. A memorial now stands on its location. Another building that suffered severe damage was the Philippine Bar Association building. Based on reports, the columns on the first floor were severely crushed that the building almost collapsed. The Old Philippine National Bank, a 6-storey H-shaped building had to be demolished because of the irreparable structural damage caused by the quake. Other buildings either suffered considerable damage or non-structural damage. While buildings collapsed in Manila, several landslides occurred and a number of ground ruptures were seen in Casiguran. Philippine Institute of Volcanology and Seismology said that this could be attributed to the quality of buildings at the time. There was no National Building Code before 1972. There was also no national disaster agency in 1968. 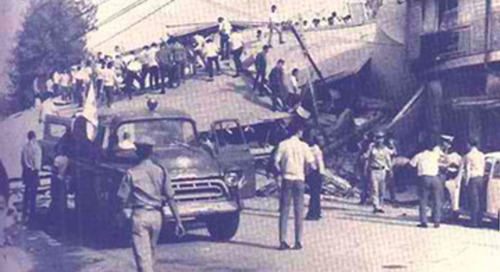 The National Committee on Disaster Operation (forerunner of today's National Disaster Risk Reduction and Management Council) was established only after the Ruby Tower disaster. Republic Act 6541, An Act to Ordain and Institute a National Building Code of the Philippines was enacted in 1972, 4 years after the disaster happened. In 1977, President Ferdinand Marcos revised the provisions of the law and called it the National Building Code of the Philippines.